Welby Ings is Professor of Graphic Design at AUT. 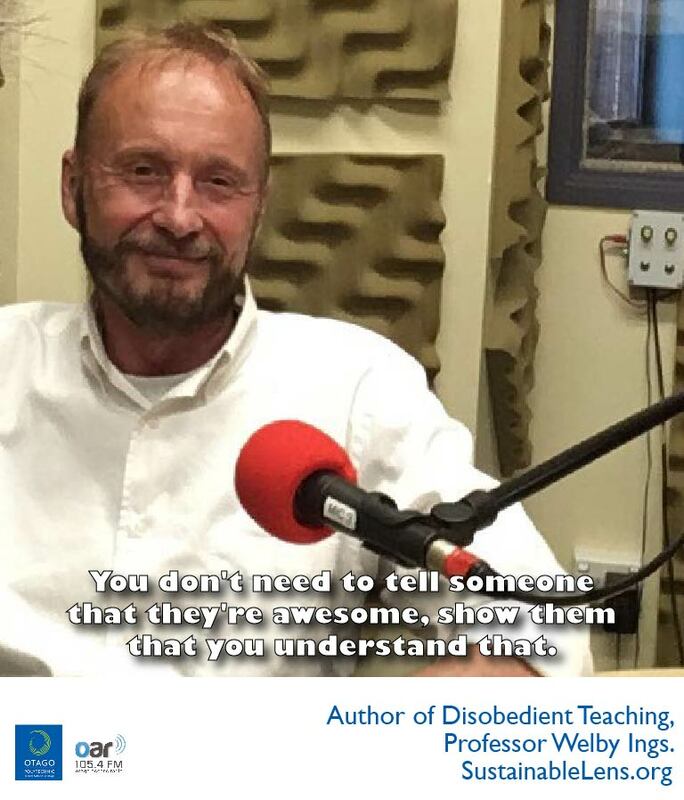 His recent book Disobedient Teaching is causing big waves in the education community. We ask Welby what drives him, and how professional disobedience can change the world. There are people in dire environments who actually effect change. You don’t need to tell someone that they’re awesome, show them that you understand that. Ask their opinion of something, or ask their advice about something. Often when we’re trying to repair someone who has been damaged and people say “what do I do, what do I do”, I say ask for their advice. Ask their opinion. Ask them to show you some stuff. The crap detectors are very good, they’re going to spot it when you are patronising. But ask something you don’t know the answer to – hanging a gate, you say this isn’t working, do think there’s some other way we could try – when they realise that you are genuinely asking them, it makes a big change inside you. When you are bit wounded you’re very sensitive to what’s false, so when you get something sincere, it has immense power. It doesn’t have much to do with hierarchy, it seems to have to do with agency. Cynicism is the death of hope and the death of agency. If you live in your world cynically then you are not going to do anything to change what is there. All you will do is accommodate and be witty about how negative it is. But you have given away the agency to change because you have divorced yourself from the thing. If you are a teacher and you are role modelling that then you are doing a very dangerous, very toxic thing to kids. If you’re in an organisation where you are trying to grow the health of it, you’re doing bad things for people who admire you, because you are teaching them to become inactive. You’re putting wit over the top of it so it sounds clever, but is actually the abdication of the power to change things. A lot of people who do effect change have a mixture of optimism and common sense. They do function with high levels of hope and high levels of belief and they refuse to relinquish that – even when an environment turns toxic they defiantly hold onto it. Oftentimes those people who are effecting change are not necessarily in empowered positions on hierarchies, and they threaten people in them because their talent is more, and they are genuinely the true leaders. Understanding how the system works – not in a bitter way – but fundamentally. The worst thing you can do with someone who opposes you is give that oxygen. As soon as someone sees themselves as binary to you, they can put aside the morals, the ethics of how they behave. If you want to have influence, do not let people hate you, don’t give them that. I don’t (have a definition of sustainability) because the idea is so important but the word is so polluted. I have a sense, but I try not to use the word. Superpower: I don’t know, I don’t believe in heroes, what I do believe in is generosity and courage. How I measure if what I’ve been doing is working is the amount of agency that gives to people, even to the point that they might disagree with me. Heroic is a very dangerous thing, it dumbs things down and it turns people into role models and that’s not sustainable because it’s not sustainable – it’s not a true thing, we’re flawed, flawed human beings. Activist: Yes. Active. Quite a long history. The point where I wasn’t I think I’d’ve lost a sense of value in myself. I see activism as a hugely affirming thing. Affirming things that are not usually acknowledged. Motivation: I’m passionate. A lot of my friends died of Aids, and you begin to understand what a life was, and you don’t waste it. It’s an extraordinary thing to have you health and a society that has got relative freedom in it and your talents, those are extraordinary things. Opportunities: New feature film. Painting. Miracle: I don’t understand war. I don’t have a frame, but it’s wrong. It it’s wrong to kill people for ideas. So world peace. But it’s not going to happen like that, it’s going to take a different kind of mind. But it’s not a wish, it needs an alert, critical positive mind.